It’s like having an extra set of hands each night, to help with the dinner rush hour. Thermomix ® saves time by finely chopping ingredients in seconds. Its versatility means that while Thermomix ® gently cooks and stirs your food, you’re free to spend time with the people you love. The large 2.2L mixing bowl and 3.3L Varoma will easily feed a crowd. The guided and automatic cooking functions simplify the cooking process, so you can easily create stress-free, delicious meals. The simple-to-follow guided instructions encourages kids to get involved in the kitchen and develop their cooking skills. 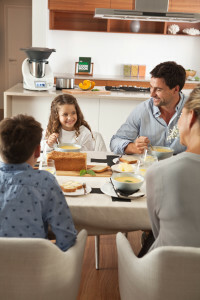 Thermomix ® gives you control over what you’re feeding your family, making it easier to eliminate artificial colours and flavours and better manage allergies and intolerances.